They draw often, my children. They both love it and for Mr 5 in particular it is his peaceful place. When he is overwhelmed it is a place to which he quietly retreats and centres himself. That he knows how and when to do that makes me proud. Of late, I have thought much about the (willing) sacrifice of mama-hood. It’s been a discussion point with friends. For me at least it is a dance of trying to find the quiet I need on occasion with the needs of my boys. Their seemingly boundless energy is something I have learned I can’t keep up with though I do try. Sometimes though, there are moments where it is clear to me how much my little men show love in their own way. An offering for me. An offering of love. This entry was posted in family, gratitude, love, mama-hood, things i'm learning on March 28, 2014 by catbeloverly. Of all the sports there are I’ve always warmed to soccer. As the least sporty kid around, even I didn’t mind playing soccer. My dad even coached our primary school team once. Lots of things about being a Mama have stretched me. 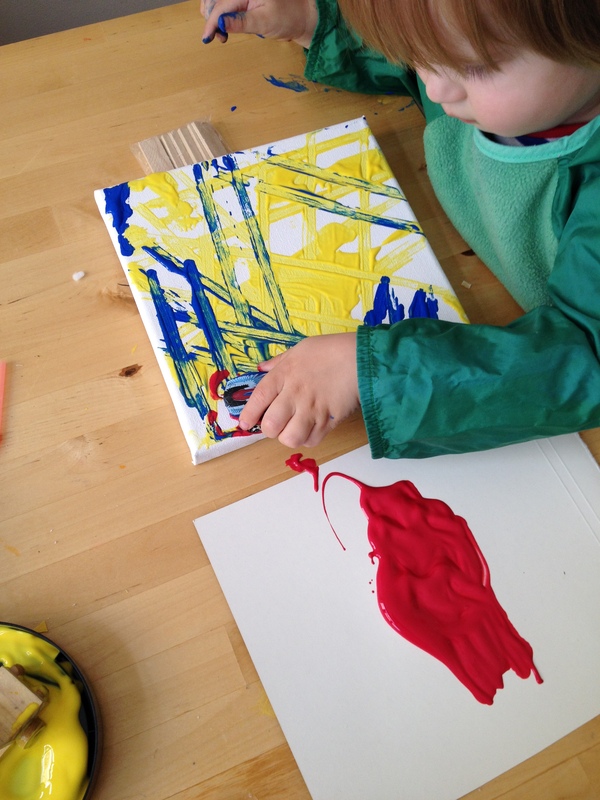 I’ve had to relax in to a lot of things and quashed my inner control freak … Hello painting with toddlers! Other things still have forced me out of my comfort zone and in to, literally, the outdoors. Mr 2 especially loves being outside and he has naturally taken to ball sports. I play outside a lot more than I would be naturally drawn to doing on my own. They are much better for it too. My boys have an interesting relationship. They’re both incredibly strong of mind. Mr 2 especially has been blessed with oodles of strong will and cannot be forced to do anything. Mr 5 is more malleable but he frustrates easily. Because of this they often argue….sometimes I’m convinced screaming is the soundtrack to my life. I try not to interfere with their dynamic too much….unless it comes to fisticuffs. Last week though, after school, I set up the soccer goals as I cooked their dinner. I left them to it and kept an eye on them from the kitchen window. And they played. Really, really played. Mr 5 tried to show Mr 2 how to dribble the ball – a skill I didn’t even know he had. And Mr 2 tried to copy. There were shrieks of laughter, shouts of, “red card”, goals scored and screaming of the happiest variety. They played together for 40 minutes. Then, they screamed unhappily as I beckoned them in for dinner. 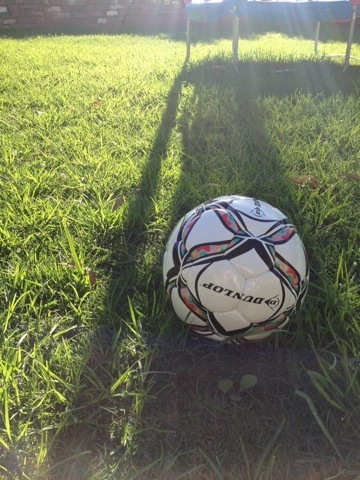 Thank you Mr Soccer Ball. You will forever be in my heart. 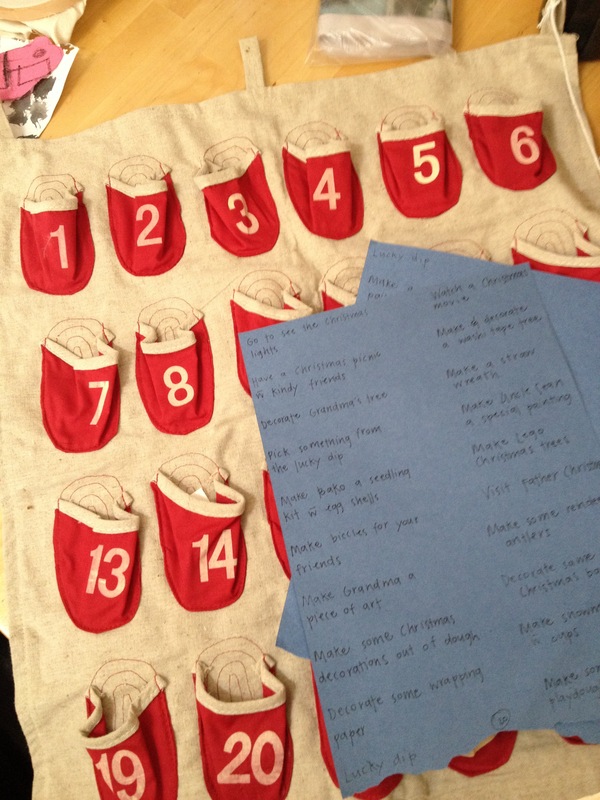 This entry was posted in family, gratitude, love, mama-hood on March 18, 2014 by catbeloverly. 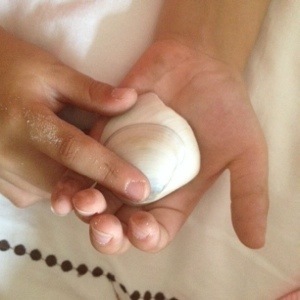 He presented me with these two shells…”of all the shells I saw today Mama, I picked these two for you. You don’t mind that one of them is a bit broken do you? I like that it’s got a jagged edge, it makes it more interesting don’t you think? The sand has made it less sharp over time you know?” The wisdom of a five year old. I’ve felt that internal sharp and jagged edge more keenly in the last few months than I have for a long time. It’s starting to smooth as I allow myself to slow down and cocoon in the haven of my family, my boys especially. Delighting in the small, laughing more and walking. Lots and lots of walking. Life has never been more full and I have never been more blessed. This entry was posted in balancing act, family, gratitude, mama-hood, things i'm learning on March 11, 2014 by catbeloverly. I’ve been really enjoying the lead up to Christmas this year. Well, I’ve enjoyed it since I finished up work and study for the year last week anyway! Mr 2 is getting excited about things like lights and Christmas trees and is old enough to participate in a number of our advent calendar activities. 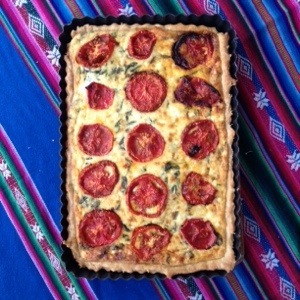 I revisited my Pinterest boards and chose some activities that I’d been hoping to do for a while and added in some teeny presents and the odd treat. 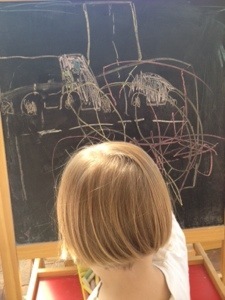 Mr 2 made some paintings with some cars… Both my little lovelies painted on some fabric for a secret project – paint was ALL over the floor! I made some sugar and orange hand scrub. 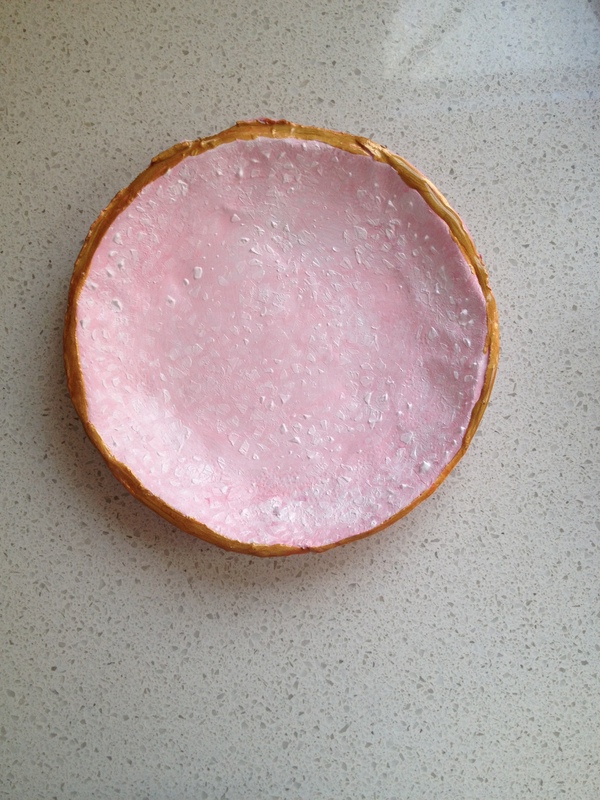 We used some air dry clay to make some dishes and candle holders… And of course I’m making a bunch of food gifts…. 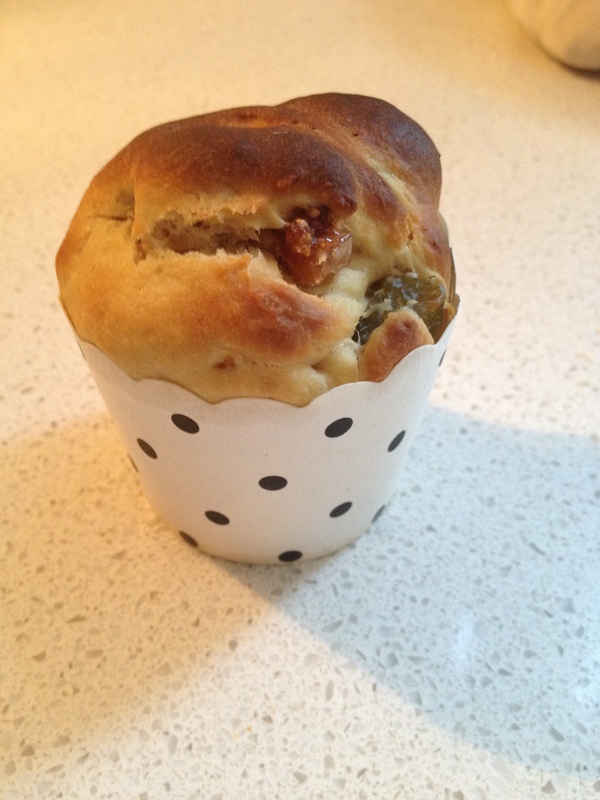 Mini panettone using this amazing recipe – it’s umm, not exactly kid friendly as it’s heavy on the booze but it is darn delicious. 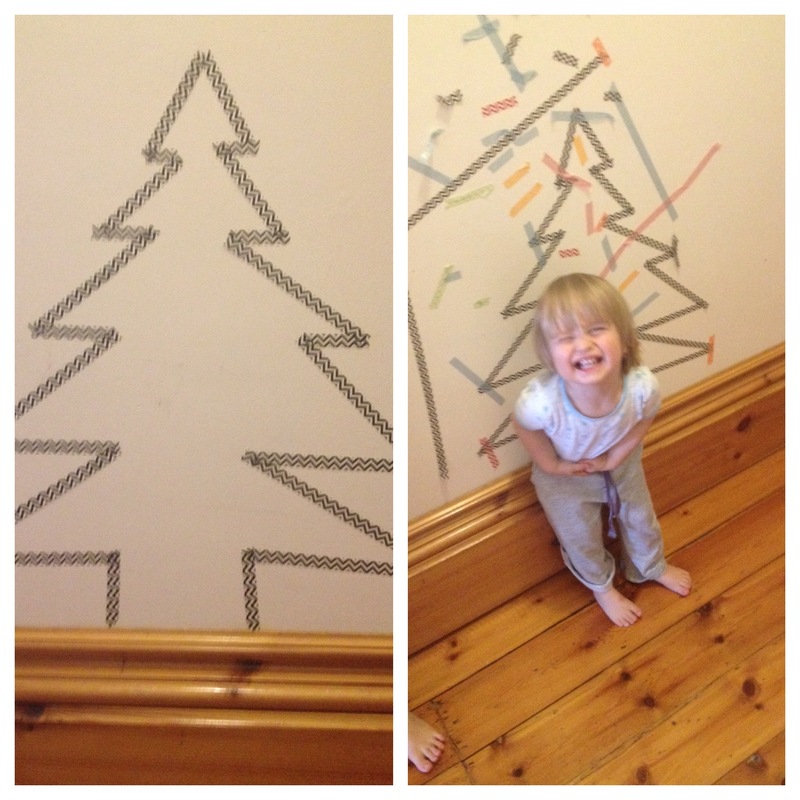 I made a big one too for us to crack on Christmas Eve. This is a really sentimental cake in my family. My Dad brought it around to my Grandparents as a gift the first Christmas after he met my Mum and my Grandpa, who was the funniest man you ever could meet in the great, dry way that I love most, asked if he’d cooked it in the BHP ovens. It’s been nicknamed BHP cake in our family ever since and we eat a slice, along with a glass of bubbles at midnight on Christmas Eve. I’m really looking forward to trying it with my family! 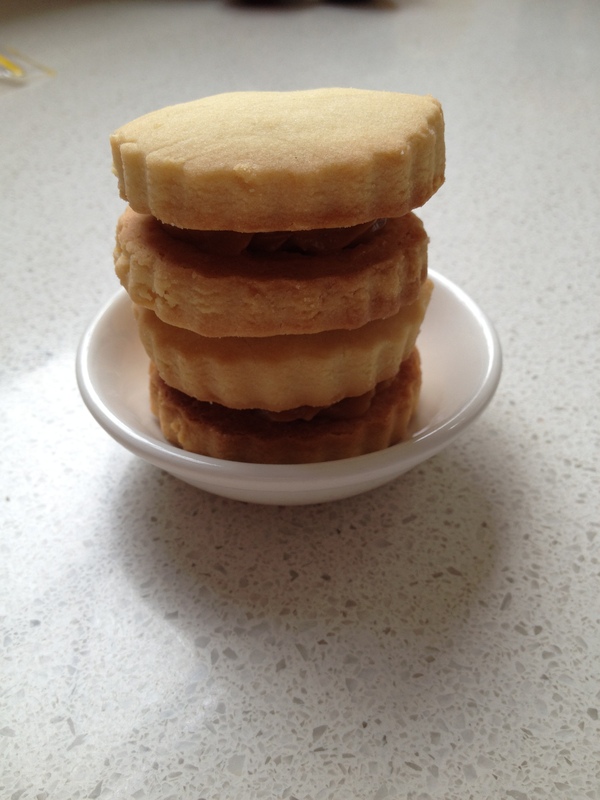 I have also whipped up a batch of two of Amy’s favourites – dulce de leche shortbread sandwiches and salted dulce de leche brownies (which my Grandma has requested for her birthday on Sunday too). We’ve done pear and vanilla jam and I am going to make up some lemon curd using lemons from our garden and some nutella meringues in the next few days. I’ll package up various goodies for family and friends though exactly how I’ll package them I have no idea as yet! With all this baking, crafting and making it’s been a fun and busy time and the Christmas spirit is in full swing around here. I love imbuing my making and baking with love and considering what gifts people would like but most of all, having the small ones around is what makes this Christmas so special….because THIS! Merriest of merry times to you all lovelies. 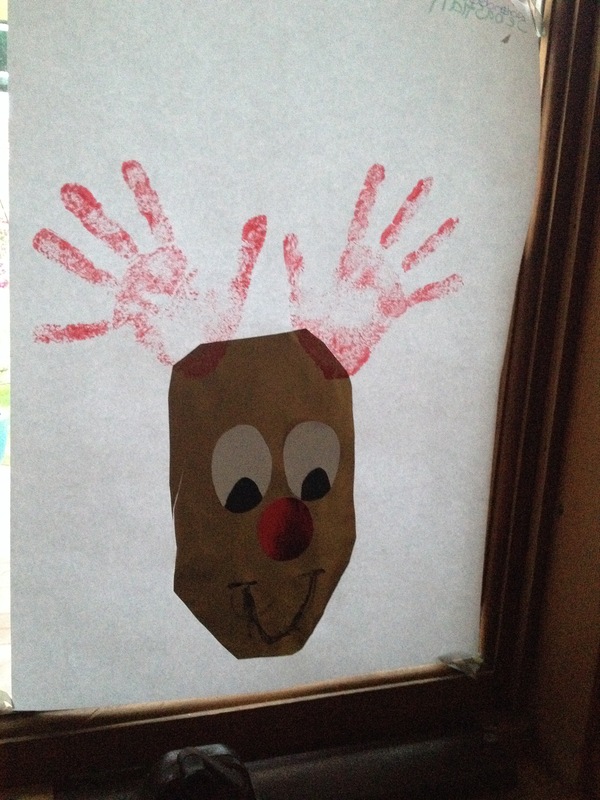 This entry was posted in christmas, creative stuff, family, gratitude, kids craft on December 18, 2013 by catbeloverly. When Bebito was first born I wanted to gift him a special book. Something that meant something. 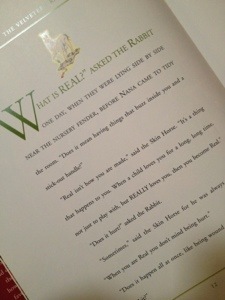 I remember this passage above from when I was 14 from The Velveteen Rabbit so this was what we bought him. It means something. In fact, I think real means everything not just something. It hurts to be real with ourselves and with others but it is the only thing we can do I believe. It is the only way I can sleep easily. I find it easier to be real sometimes than others. Some of what I write here, like my last post, is raw and real and I don’t think you have to be raw to be real. I also think my version of real may be different to yours. And that is how it should be. I don’t think real means mean or brutally honest either though I think some people see it that way. Sadly, I think being real opens us up to being hurt by others who don’t know how to respond to the real within us because the real within them is buried too deep. Yesterday I was given great advice by a health professional to be pragmatic about what my life involves at the moment and to take far better care of myself or there will be consequences. Time to be real about my health. I needed to hear it. I had to hear it. Today I received a beautiful gift and note that really touched me from Pip. It means a lot to me to know my version of Real is understood by others and I’m not completely neurotic. “Once you are Real you can’t be ugly”. This entry was posted in about me, balancing act, family, gratitude, health, mama-hood on November 5, 2013 by catbeloverly. I posted the above quote on my Facebook page yesterday and I think it contains the recipe for a really good life. My days are long and full. It’s a fuller life than I ever imagined. My mind races and stresses far more than I would like. But I have created this life. I have let some things go. Set my priorities. Set goals even. I need to let more things go. Prioritise more. Find the fun in the mundane and even the irritating. Be braver than I thought I could be. Push myself a little. 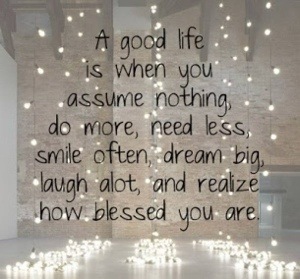 Count my blessings. For years I thought myself an extrovert. I thought because I like to chat it meant I was an extrovert. And maybe, 15 year old me was an extrovert but if she was that was fleeting and only because I was finding my way in the world. Trying on different outfits so to speak. But I’m not. I’m an introvert. Someone who is internally motivated. That is what an introvert is. I love to feel connected to people but I need to seek out the quiet. Sit back. Think. Process. Be. La dolce vita. For years I’ve been thinking that a good life is a balanced one but I believe now that balance isn’t about keeping the scales even all the time but giving things the due attention when they need it. What’s your recipe for the good life? This entry was posted in about me, balancing act, gratitude on July 4, 2013 by catbeloverly.